Valley Hardwood Supply provides woodworking materials for both professional and novice woodworkers. We carry an amazing assortment of both domestic and exotic hardwoods. If we don't have what you need, we can special order most hardwood products! We sell by the boardfoot and will cut exotics by the foot. You won't find an assortment of exotics like ours anywhere else in the Fargo-Moorhead area, and if you are from out of town, we are willing to ship. We sell cabinet grade plywood as well as baltic birch plywood. We also do custom woodworking! Valley Hardwood Supply began in 1979 and moved to its current location in Dilworth in 1981. Brandon and Janet purchased the business in April 2018, and are thrilled to carry on its tradition. Mike has personally trained Brandon and is still around for expertise and guidance. You might even catch him helping out once in a while. Valley Hardwood Supply is a family owned business. 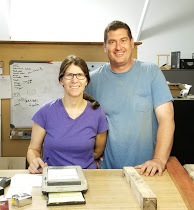 Brandon and Janet are happy to provide for your woodworking needs and are excited to help you fulfill your woodworking vision. Give us a call at 218-233-8020 or stop in and see us today to discuss how we can help you with your woodworking needs!